The theory of gravity, helium, air — all of these are elements or concepts you can’t see smell or taste. However, they are a necessary part of being alive and tethered to this earth (or in some cases, not). They’re useful, good for us and can be fun, important parts of our everyday life that, for the most part, we don’t even think twice about. But not everything that you can’t see, smell and taste are things that are good for you. Sometimes, the worst things in your water are disinfectants that are invisible to the human senses; and they’re not just gross…in the wrong quantities, they’re bad for you. Whether you’re on well water or city water, the water in your home can contain many naturally-occurring contaminants, like iron, magnesium, and calcium. However, particularly if you’re on city water, they oftentimes contain chlorine or chloramines — compounds used to disinfect your water before your water even enters your home. Whether you’re on well water or city water, the water in your home can contain many naturally-occurring contaminants, like iron, magnesium, and calcium. For city water, unfortunately, naturally-occurring or not, some of these contaminants and minerals alike can carry trace odors and colors along with them, from the tap to your glass. For example, your spouse may turn on the kitchen faucet and notice an awful rotten egg smell coming from the sink – that’s sulfur. Does your water look brown and dirty? That’s often from rust or manganese. Or does your water see, smell and taste just fine but causes excessive drying to your skin and hair? That’s typically chlorine or chloramines. Your dog has a keen sense for these things, and if you notice that they’re drinking out of the toilet bowl more often, that’s because the smell has dissipated from your bathroom as it has been sitting in a stationary place for a longer period of time. And while disinfectants are both great for removing bacteria and harmful viruses from the water, neither are them good for the human body. And that’s just if you’re on city water. If you’re on well water, the EPA doesn’t even require that your water goes through any kind of treatment process at all. Yikes. Nothing goes with your morning cereal like a cup of joe. The warm aroma, the nutty flavors, all percolate in your coffee maker while you check off your last minute to-do’s or read your morning paper. But if you’re drinking unfiltered water, those breakfast staples could have an unfavorable taste and odor. If, as we mentioned before, most city water contains chlorine or chloramines, that disinfectant will not only drip into your first cup of coffee in the morning, but it will also steep in your pasta, boiled veggies, and other foods, too. But don’t just take our word for it. Local coffee shops and bars, like the Alamo Drafthouse movie theater, make use of the secret ingredient that is filtered water all too well. But how else can filtered water make a difference in your life? Let’s take a look. But it’s not important to just consider the benefits of filtered water on your coffee, pastries or steamed buns. Your refrigerator, dishwasher, water heater, and your washing machine are all constantly exposed to whatever’s in your water. That can be really hard on the lifespan of your appliances. But filtering that water can actually mean the difference between spending money on cleaning products to help keep your dishes film-free, and finally taking your plumber’s phone number off of speed dial. Imagine that! When you filter that water, you can have peace of mind knowing that your linens are brighter, your ice cubes are cleaner, and your refrigerator water was made without chlorine and chloramines. Now that’s something to cheers to. Having a long soak in the tub after a hard day’s work shouldn’t be just another pipe dream. Our bodies are delicate ecosystems, and with unfiltered water, you could be introducing your personal ecosystem to a whole host of things. Your skin can soak up contaminants that may be present, your lungs can inhale contaminants that evaporate into your shower steam, and your hair follicles can absorb what’s coming through your pipes. In the calm, quiet moments of self-care at the end of your long work day, worrying about what’s in your water shouldn’t even be an item on your to-do list. 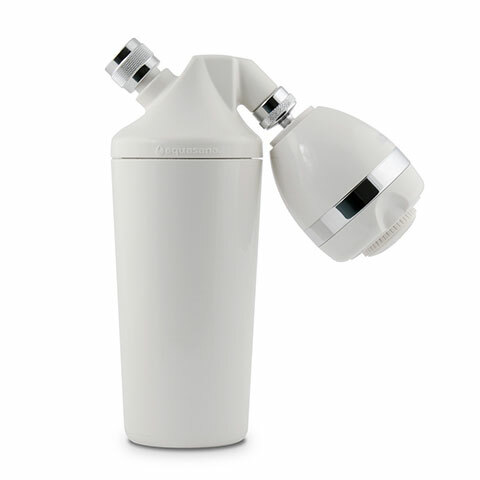 Showering in unfiltered water, especially for those using city water, can include contaminants like chlorine or chloramines, as well as harsh pharmaceuticals, pesticides and herbicides that easily absorb through your skin and hair causing excessive damage and drying, and can even make your vibrant hair color fade. And inhaling it can make you more prone to allergies and, for those with asthma, can increase your chances of an asthma attack. Clean, filtered shower and bath water can make a world of difference when it comes to your skin, hair, and lungs, can improve the air quality in your home by removing more than 97 percent of chlorine or chloramines in your water before they turn to steam, and can help you and your family can rest easy in the fact that you’re experiencing a healthier lifestyle all around. Your hair and skin will thank you for it. 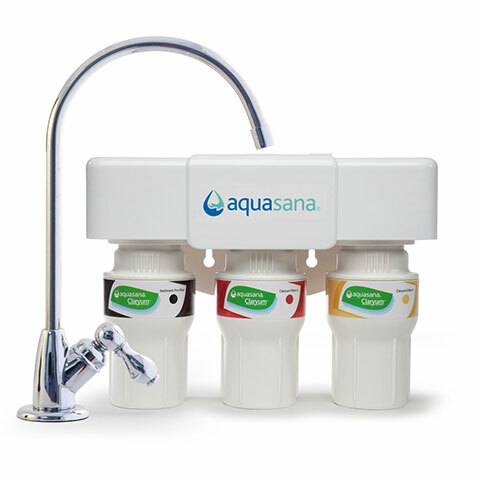 At Aquasana, we’ve spent hours researching and identifying which contaminants and disinfectants give your water an undesirable taste and smell, and have designed filters that reduce them. 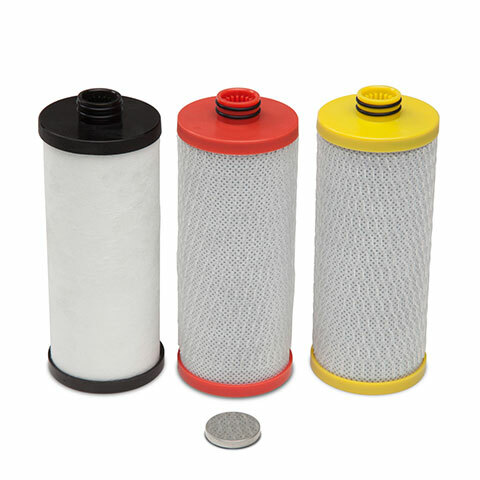 In fact, many of our products — like our 600,000 Gallon Whole House Rhino Filter — are NSF certified to remove 97% of chlorine to improve the overall taste of your water. If filtering your drinking water wasn’t your top priority, it should be now. And adding Whole House filtration to your drinking or sediment filtration system is just another way to get healthy living right. Do your home, your body, and your mind a favor and get rid of the contaminants lurking in your sink and shower, because at Aquasana, we believe clean water is healthy water.